Winter is just around the corner! With longer nights, securing your valuable assets is even more important. Don’t let thieves have the upper hand, protecting your site is just a phone call away. Advance Guarding can give you peace of mind and a good night’s sleep. We offer static guards, mobile patrols or a combination of both, together with the latest in CCTV innovation. 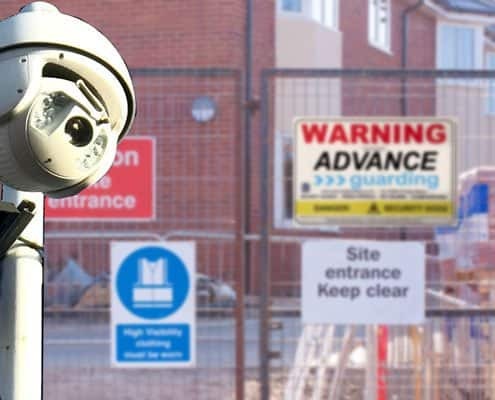 If you have a construction site that needs protection, Advance Guarding can install a CCTV system around your premises, this links to motion sensors and a call centre. When the intruder triggers a sensor, images are recorded for later evidence, while the monitoring station will instruct one of our patrols to visit your site. This can give you a significant upper hand in crime prevention. Our CCTV solutions can work 24 hours without a break, so whether you are closing up for the weekend or Christmas holiday, your site will have dependable 24-hour cover. Give our sales support team a call now, to start protecting your site! Call 01903 269 990 or contact us via email.